With so much good stuff coming out of Games Workshop recently and at a pace that doesn't appear to be slowing down any time soon, it's become more & more difficult deciding what to focus on and invest in next. Planning out future purchases is typically a really fun task, especially when it comes to hobby-related purchases. But I hit a bit of an impasse with my own hobby buy-list earlier this week, some items which I thought had been settled on since the holidays. Now, we've all bitten off more than we could chew before... started on one too many armies/projects, sometimes across multiple game systems, and you're interested in all of them. Usually I have a front runner among my projects and I'll direct most of my effort there until it's complete or priorities shift around again. But this is one of those times where I have no less than 3 concurrent projects that are on roughly equal footing as far as my interest level goes. So it's down to those 2 all important life factors to help narrow the focus and make some decisions: time & money. Time there's never enough of and when you're a parent to small children on top of all the other real life stuff you do the best you can. I'm always looking for ways to free up more but at this stage you know there's a finite amount of it and all the different areas you need to spread it across in a given day. With time being more constrained this makes the lower model count projects more appealing for now. As readers who have been here before know, I tend to start on a lot of different projects and finish very few of them. I know my chances of actually finishing a project are higher the fewer models/steps that remain, but it's also not always that simple when deciding how to spend my hobby time. You have to mix things up, keep things interesting. This is a hobby after all and it's just not as relaxing or fun when I take too rigid of an approach to it. I also just turned another year wiser (hopefully haha) and like to think I know myself a little more and make smarter choices while avoiding earlier pitfalls. I know now, for instance, that the biggest motivating factor for me when it comes to "completing" models is whether or not I have an upcoming event or commitment in the near future where I'll get to use them. I've taken care of this part; already bought my NOVA 2017 pass! I'm registered for Blood Bowl: Darkness Fouls and still deciding if I want to try one of the AoS events, 40k Narrative Recon Squad, or something else. Money, well let's be real, also never seems to be in abundance and gets divided even more ways now. Otherwise I would have probably sprung for most of these things upon their initial release. There's now 2 box set installments for the new Warhammer Quest (WQ) which I know I'll enjoy -- as if I weren't sure beforehand (and I was), reading this month's White Dwarf Designers' Notes on Shadows Over Hammerhal made me want to jump right into that game. I'm also intrigued by GW's standalone box game Gangs of Commoragh, which now has rules for using Harlequins in the game. Then there's the announcement of a new game, Warhammer Underworlds: Shadespire, which looks promising. Oh yeah, then Shadow Wars: Armageddon, which is basically Necromunda 2.0. Not to mention all those box sets from last year I was interested in but also couldn't find the time or money. All good signs for GW as they continue to deliver things that fans have been wanting and talking about for decades (we may even be getting a plastic Thunderhawk). It really is a good time to be in the hobby! But alas, I must at least feign a level of focus. So it's back to my goals list from January for a little direction. The Blood Bowl goals I'm actually doing pretty well on. So I chose to focus on what I think is the biggest hobby project, 2000pts of Stormcast Eternals... painted. Yeah that's a pretty big project but it's one that I have a fairly good start on with all of the AoS Starter Set assembled and a few models painted. I ended up ordering the Start Collecting: Stormcasts box to help fill out some core units, plus it's the perfect compliment to the Starter Set giving you the exact number of Retributors you need, and just an otherwise bloody good deal for the models you get with it (yay more Prosecutors!). I also sprung for a box of Judicators as they can be made Battleline and offer some ranged goodness that my army currently lacks. 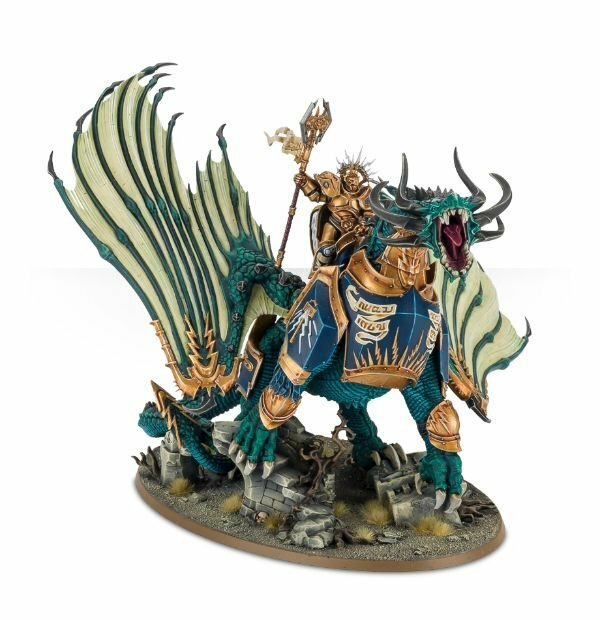 My final purchase is something I knew I had to paint at some point from the moment I finished the Lord-Celestant on Dracoth, and it also happens to add a nice 600 points in one fell swoop bringing my collection up to just over 2000pts, allowing for this goal to now be achievable. I can't wait to get this kit!